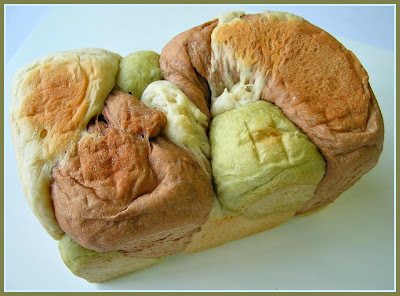 I have always thought that I will have to make two separate doughs in order to produce a dual coloured marble bread. Which also means that I will have to use the bread machine to knead one dough, while I work on the other manually. It will be impossible to get the bread machine to knead both doughs as there will be at least a half hour lapse between the two doughs, no? Thanks to this Chinese cookbook on bread making that I found the way to get around with the problem. All I have to do is to knead the dough just like any other bread recipe. After the bread machine completed the kneading cycle, I divided the dough into 3 equal portions. Don't be lazy, use a scale to weigh the dough so that you get three equal portions. For one of the doughs, I kneaded in half a teaspoon of green tea powder...the 2nd portion I added in one teaspoon of cocoa powder (it was supposed to be half teaspoon, but I used the wrong measuring spoon!!). The 3rd portion I left it plain. It was not too difficult to knead in the powdered green tea/cocoa...just a few gentle kneading should get the powder fully integrated into the dough. I didn't follow the recipe on the flavourings as it uses green tea, curry powder, and a red ingredient which I am not sure what it is. The three dough were then left to rise in separate bowls. After they doubled in size, I shaped them into rounds and left them to 'rest & relax' for about 10mins before they were shaped into long ropes. The doughs were quite easy to handle...except for the plain dough which was still a bit sticky after the first proofing. The three long ropes were then plaited. After the braided dough was left in the tin to proof...I noticed something wasn't right. The plain dough started to tear away as the dough expanded. Since I couldn't do anything at this stage, I sent it to the oven to bake after the second proofing. 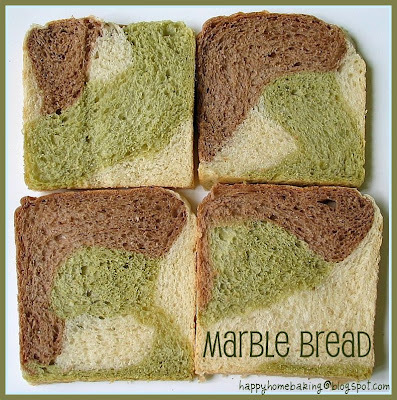 I only felt sightly better after I sliced the bread...at least the swirls and marbling effects were quite interesting. and each slice of bread has got it's own unique pattern! The texture of the bread was excellent...soft and light. Even though I could taste the cocoa powder in it, the bread tasted really plain on it's own. The taste was not very different from any of those plain store-bought sandwich bread. The flavour from the green tea powder was so subtle that you won't know its existence if not for the colour. 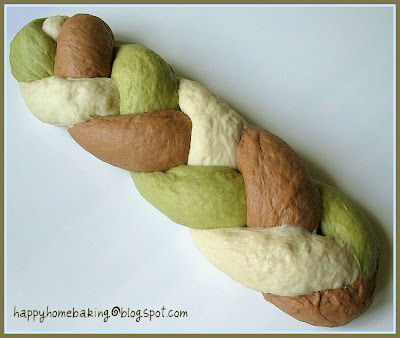 So, have you been wanting to try out a colourful bread all this while? If the answer is positive, why wait?! Place water, sugar, salt, bread flour in the pan of the bread machine (according to the sequence as stated in the instruction manual of your bread machine). Make an indentation on the flour and add in the instant yeast. Select the Dough function of the bread machine and press start. After about 8mins of kneading, add in the 20g of butter. Let the machine continue to knead the dough. After the kneading cycle has stopped (20mins), Stop and Restart the machine. Continue to let the machine knead for another 10mins. Remove dough from the bread pan. Divide dough into 3 portions (about 170-180g per portion). On a lightly floured surface, take one dough and knead in the cocoa powder. Repeat the same with the second dough with the green tea powder. Place the doughs in 3 separate bowls, cover with cling wrap and let them rise till double in volume, about 60mins. Remove doughs and give a few light kneading for each dough. Press out the trapped air as your knead. Shape into balls and cover with cling wrap, let the dough rest for 10mins. For each dough, flatten and roll out into a oval shape about the size of 30cm by 15cm. Roll up, lengthwise, swiss roll style to form a long rope. Plait the three long doughs. (It is not necessary to plait very tightly). Pinch and seal the ends tightly. Place the plaited dough into a pullman tin* (well greased). Tuck the ends down. Cover the lid and let dough proof for 60mins or until the dough rise up to 90% of the height of the tin. Bake at preheated oven at 180-190 degC for about 30mins. Remove from oven and unmold immediately. *size of my pullman tin, about 7.5" x 4" x 4"
your pix trail is great! i think it would have turned out nicer if u din put into the bread tin. i was disappointed too when i saw the one after baking but they looked good after slicing :) Tks for sharing. the patterns are really interesting. Looks pretty too. lol..never judge a bread by it's cover right? The sliced bread looks good! Those cut slices are so pretty! oh, this is so lovely! Not disastrous at all! I need to try this soon. You braided that bread perfectly! Mine tends to be a little plumper in the middle than on the ends. And the marblized center is just lovely. I never knew plaited bread can look so beautiful when baked in a pullman tin. Amazing! 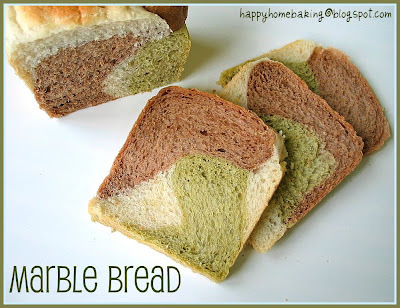 HHB, the sliced bread looks very pretty lah.Not a disaster at all. HHB, sometimes my bread will have the same "problem" as yours, i.e. the dough tearing apart as it expands. I'm not too sure what causes it, but most of the time the bread turns out fine. Do you think it could be because the dough is too wet? I'm still trying to "diagnose" this problem. So if you happen to find out, can let me know also? Anyway, your loaf turn out great, so I don't think you shd consider this as failure. Hi! It's been a while that I drop by! Still remember me? When I see your bread it instantly reminds me of "Do What I Like" blogg. 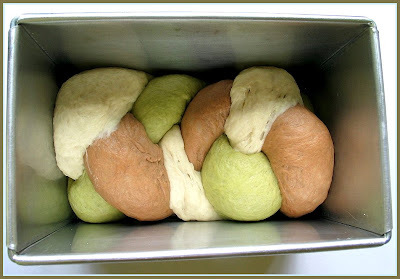 She uses the same colour to make a Pandan bread. It's gorgeous. Maybe you would like to check it out! Your loaf looks very interesting! Didn't know that plaited loaf can turn out so "squarish" in a pullman's tin! Hi Jacelyn, that's my exact sentiments! Mandy, I'll be keeping a look out for your bread! 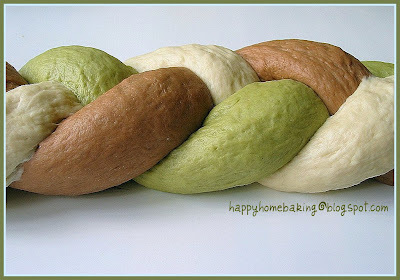 Hi Susan, I should have seen my first attempt on braiding a bread...it looks horrible! SSB, I didn't know this can be done before I read the book!! dear WF, you have the same problem too?? I too suspect that the dough could be too wet...I think I should have added a teaspoon of milk powder for the plain dough...as the cocoa and green tea ones were really easy to handle. Oh are u refering to the Panda bread...that is a very cute bread! Will love to try it one of these days. 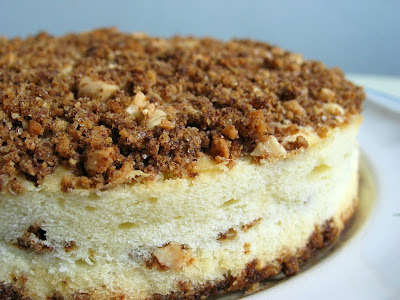 MyHomeKitchen, you should have seen the photo in the cookbook (I borrowed it from the library) it was a perfect square! may i know how did u make the pattern for the slices of bread? its so nice with the colours...may i know wat is the steps to make this kind of colour combination for a square bread loaf..? My oh my! This loaf looks goregous! I bet it taste real nice too! the sliced ones looks real beautiful & unique!! :) looking fwd to see more pretty creations from you! hahah but i'll try agn!! I wouldn't call this a disaster at all!! your bread is beautiful!!! if this is your disaster, i wish i had more of your disasters in my kitchen!! beautiful bread!! Hi Elinluv, yes, u can knead this manually. However, I have not tried kneading it by hand, I can't give u much tip on how to go about it. Looks awesome. How did u do that. Its really tough making that knead. But the sliced pieces are so wonderful. will you be able to advise me on where you got your pullman tins? Hi Ling, I got my pullman tin from Phoon Huat...although I think you should get it from Sun Lik instead, as I heard that those from Sun Lik comes with a straight edge/side, whereas mine is tappered. Hope this helps. Hi Emmy & Icey, you can buy green tea powder online. I am currently using this brand (http://www.amazon.com/gp/product/images/B000FNJ5JO/ref=dp_image_0?ie=UTF8&n=3370831&s=gourmet-food). I never seen any colorful bread like this.I don't know about its taste but its looking so great. oh I am sooooo going to try this recipe... looks so COOL!!! sure doesn't look like a disaster to me at all... thanks for sharing!!! Hi, i have a question, I tried making the milk bread on your site and it came out really nice. However, there's still a yeast aroma in the bread, even after i bake it. Can you tell me what i'm doing wrong? Or what i need to do to make it smell like fresh baked bread, not yeast? Thank-you very much!! Tried making this bread yesterday. It was ok except that maybe my pullman's tin is big so it didn't rise up to the top. My tin is 10" long. I bake for around 45 mins instead of 30 mins. It was beautiful after slicing only that it was short. Will be making it again soon. Recipe definitely a keeper. Hi HHB, I do not have a pullman tin but I do have a loaf pan. What I would like to know is that do we bake this with lid on or without lid? The lid you mentioned is only for proofing only? Thanks! Hi Quinn, the pullman tin comes with a lid, this bread was baked with the lid on in order to yield a square loaf. You can always bake it with your loaf pan, uncovered. Hope this helps. Yeah, this piece of info helps. I would like to ask how did you get such a dark brown & green? I used half a teaspoon of cocoa powder too but it turned out rather marble-like after it was kneaded into the dough. My end-product was a very slight colouring, not as pretty as yours ): Are there any other methods to colour bread? Hi Charmine, for this bread, I used Hershey's natural unsweetened cocoa power...maybe it gives a darker colour than other brands? I am sorry I do not know of other methods to colour the bread, maybe you will want to add a little more cocoa powder? but the taste will be a little bitter. Hi, I knead the cocoa powder and green tea powder by hand.